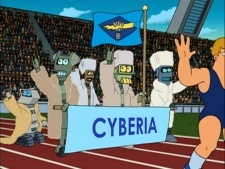 Cyberia is an Earthican nation whose Olympic team competed in the 3004 Earth Olympiad. [4ACV13] Cyberian citizens are most likely robots, since there are no non-robots in the team and the flag features a robot hand. The nation's name is a pun on the prefix "cyber-" and the name "Siberia". This page was last edited on 29 March 2014, at 01:30.